Do you like the idea of camping – being at one with nature and outdoors – but dread the idea of sleeping on the floor and trekking across the field to the toilet block in the middle of the night then maybe you should think about trying glamping – AKA glamorous camping. Come and stay with us at Valleyside Escapes; a luxury family-friendly glampsite in the historic village of Bickleigh-on-Exe in Devon. 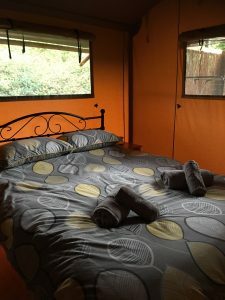 Our safari-style tents have everything you need to make your holiday as fun, cosy and enjoyable as possible. 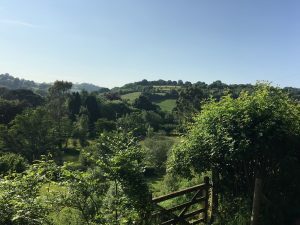 The best bit though is the outside – a veranda overlooking the beautiful Exe valley countryside with rolling patchwork hills and you can even see a vineyard! It’s a great backdrop to enjoy a family meal together or just sip on an ice cold beer or wine and take in the scenery. For the children there is a play area with swing, slide and various balance beams and tyres to keep them amused, for a little while at least. You can really make the most of the space and being together and the whole family can join in playing the various garden games that are provided or take it in turns to test their ball skills on the boule court. 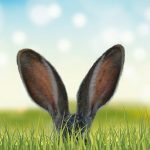 There is also nature on your doorstep…we have sheep grazing in our Orchard and in our lower pasture, you will see and hear all sorts of different bird song including pheasants and peacocks and the odd fox or rabbit may drop by as well. Our chickens are often seen taking a stroll on the footpath to the glamping field. If you want to get out and about locally there is a pub and bistro within 200 metres and even more within a short drive – a night off cooking is definitely in order. There is also the Devon Railway Centre a two-minute walk away, with train rides, model railways, play areas including a soft play, ball and sand pit! There are numerous other attractions in both north and south Devon that can be reached from Valleyside Escapes that make it a very accessible and convenient base. If you have never been glamping then now is definitely the time to give it a go – embrace being outdoors with the added comforts of home. Just remember the walls are canvas so you may need to bring some ear plugs if any of your friends or family snore! We hope our guests will leave Valleyside Escapes relaxed and with some special holiday memories to cherish forever.